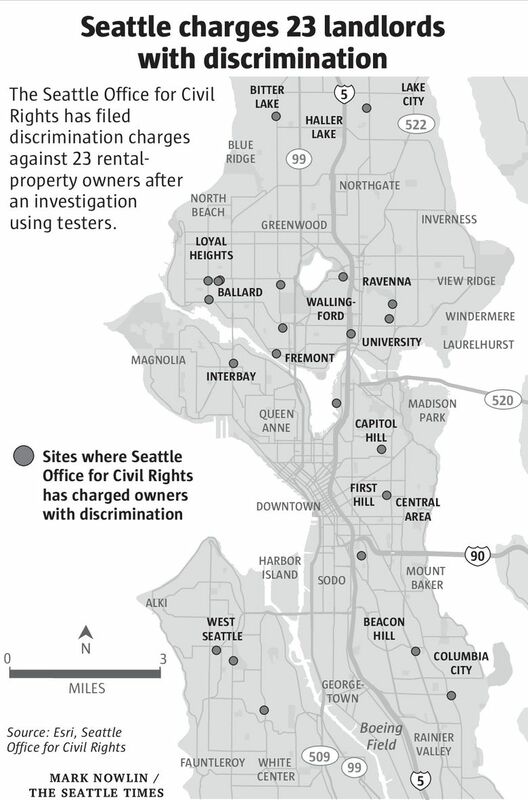 Seattle officials have charged 23 landlords with discriminating against prospective renters after testing for illegal treatment at properties across Seattle. 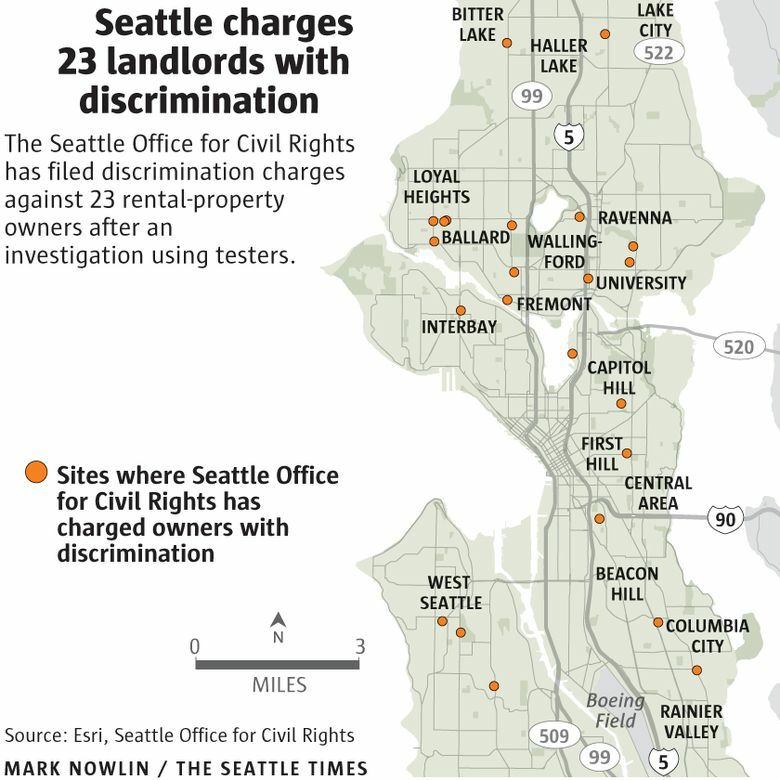 The Seattle Office for Civil Rights has filed discrimination charges against 23 landlords after a series of sting operations aimed at rooting out bias against renters. The office paid “testers” posing as prospective renters to check for illegal discrimination based on family status, disability and use of Section 8 rent vouchers. Nearly a third of tests for discrimination based on family status and nearly two-thirds of tests based on disability and Section 8 vouchers revealed some evidence of different treatment, the office said in a news release. There were 97 tests overall, resulting in two charges related to family status, six related to disability and 13 related to Section 8 vouchers. The civil-rights office also used evidence from the tests to file a discrimination charge related to national origin and another related to marital status. The new charges follow 13 filed about a year ago after testers checked for discrimination based on race, national origin, sexual orientation and gender. Some landlords in the recent tests provided less information to testers who said they had children, the office said Monday. Some landlords also used occupancy standards to discriminate against children, restricting the number of people in a two-bedroom apartment to two, for example. Some landlords turned away testers with service animals, refused to waive pet fees for service animals or hung up on testers using the state’s relay service, which helps people who are deaf, hard of hearing and speech-disabled communicate. Finally, some landlords refused to respond or outright rejected testers who mentioned using Section 8 vouchers, the civil-rights office said. The tests were conducted between September and December of last year. The civil-rights office didn’t immediately provide The Seattle Times with its case files, which contain specifics about exactly what each charged landlord allegedly did wrong. The properties where landlords have been charged are all across Seattle, with 13 north of the Lake Washington ship canal, including three in Ballard. The civil-rights office sent letters to the landlords after the tests and have offered to meet with landlords whose results showed evidence of discrimination. The office’s annual budget for housing-discrimination testing is $50,000. Last year, settlements with charged landlords resulted in the office recouping more than $19,000. The office, which contracted with the Northwest Fair Housing Alliance in Spokane to carry out the recent tests, plans to embark on a new round of public engagement about housing discrimination, including free training for landlords and their employees. Melany Brown, executive director of the Rental Housing Association of Washington, called the results of the tests unfortunate. In a statement, Brown said the charges present an opportunity for her group and the city to educate landlords and raise standards. Seattle already prohibits discrimination related to Section 8 vouchers, but Murray last month proposed an ordinance that would protect renters using other legal, alternative sources of income, such as veteran’s benefits and child-support payments.